I believe in unrestricted freedom of speech, so you are pretty much free to write whatever you want. I do however reserve the right to delete posts that are either harmful, contains illegal stuff or contains threats towards other people. I alone decide if this has happened. I may choose to ban people from posting in cases of misuse. To prevent misuse, your IP address will be logged, but it will not be visible to others. Check this checkbox if you agree and you will be allowed to post. I've been a rather lazy reader in the past few years, and this one had sat on my shelf for far too long. That's a shame because it really deserved to be read. 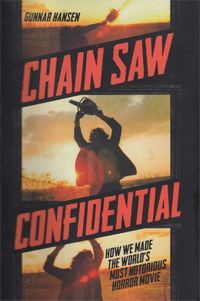 It is a mighty fine book by the great Gunnar Hansen (aka the original Leatherface himself) and it provides tons of information on the world's greatest horror movie ever, Tobe Hooper's "The Texas Chain Saw Massacre" . The book is very well written, and the 230 pages went by in no time. We get all the details on how they made every scene throughout the movie, and the pain it was to film in the merciless Texan Sun on a minimal budget with a minimal crew. Gunnar had interviewed a lot of the original cast and crew for the book and also drew on other interviews and sources. This is basically everything you ever wanted to know about your favorite movie and then some. A favorite story is when Gunnar ran through the woods with a running chain saw, wearing a human flesh mask that barely allowed him to see anything and then he slipped and fell. It should have been terribly interesting lying there on the ground wondering when and where the flying saw would hit the ground again. Stunt actors are only for pussies! Another favorite is the dinner scene (known as "The Last Supper".) It was filmed in the ridiculously hot house where they suffered endless retakes for more than a day. It is one seriously intense scene to watch on film, but it was pure hell for the cast and crew to actually get through the filming of it. The book tells the story of how the surprisingly successful movie never made any real money for the crew or cast because of terrible business decisions, mafia involvement, incompetence and law suits. In the last chapters of the book, Gunnar gives an insightful and great analysis of the impact of the movie, it's place in horror history and why some people hate it so much, including some retarded critics, who probably don't look very clever today if you read their reviews. 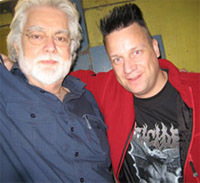 It was a fantastic experience for me when I met Gunnar in Copenhagen in 2011 and had a long chat with him and also saw him present the Chain Saw movie at the Copenhell Festival. He turned out to be a very friendly man with so many fun stories to tell. This book is the second best thing to hearing those stories in real life, something that is sadly no longer possible. Gunnar died in 2015. RIP.